A study aid that accelerates your learning in real-time so that you can better your learning, test and exams marks. Answer questions and learn what it takes to increase your learning, tests and exam results. Start and submit the Interactive Past Exam, which in turn detects your problem areas and unaccomplished learning outcomes while simultaneously marking your exam in real-time. Receive your results, corrections and feedback through study tasks that recommend actions for turning your identified problem and unaccomplished learning outcomes into additional strengths. From the Study Tasks, you can now improve and advance with personalised study, practice, review, rewrite, etc. as you gain the competency to achieve higher marks in your final exams. Students who used exams as a learning tool retained 50% more knowledge than those students who only used the method of studying material or using mind maps. Tumelo, a grade 12 student, was able to improve his grades through the study aid, which was recommended by his teacher. He used the study aid for the following subjects: Mathematics, Life Science, and Physical Science. 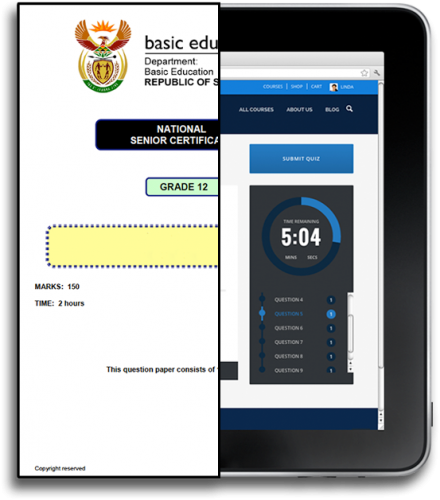 First and foremost, the study aid helped him identify problem areas that negatively affect his exams and his final matric results. Secondly, the study aid helped him overcome his problem areas by significantly increasing his knowledge of his subjects and enhancing his retention rate. Lastly, the study aid helped Tumelo gain the self-confidence and motivation needed to study even better and unlock his potential. Familiarise yourself with different levels of question difficulty, so you can better prepare for multiple exam questions that may arise. You can access Interactive Past Exams through school desktop computers and mobile devices laptops. In a matter of seconds, your feedback is issued, allowing the you to view results and work towards desired marks. Just complete and submit your Interactive Past Exams. You will then receive Study Tasks that help accelerate your learning. Why focus on final exams performance? Grade 12 final exams have the biggest impact of the final matric report. Final exams account for 75% of the student’s year mark and other academic activities during the year (including assignments, tests, etc.) contribute only 25% of the final report. Why do you choose to aid students with past exam papers/questions? Past exam papers are set on the same standards as current and future exams, so we found this to be the best method to prepare students on the level of exam difficulty while spontaneously helping them accelerate their learning. Why do you convert all questions into multiple choice format? There are two reasons for this; the first is technical as multiple choice questions can be marked by algorithms in real-time enabling students to receive instant feedback. Secondly, multiple choice options simplify the process of identifying if learning outcomes have been met. All lessons, notes and additional resources are based on the CAPS curriculum. What do students need to access Interactive Past Exams? An Internet connection and a desktop computer (both of which are provided by schools). Students can also use laptops, tablets and smartphones. Which subjects currently have Interactive Past Exams? View all Interactive Past Exams.